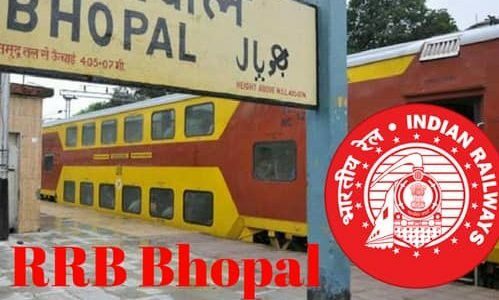 RRB Bhopal ALP CBT 2 Admit Card 2019 | Railway Recruitment Board of Bhopal has declared the examination dates for RRB ALP CBT 2 along with the CBT 1 Result announcement. The examinations are starting from 21st January 2019. To appear for exams, the candidates will require RRB Bhopal ALP Technician Hall Ticket 2018 -19. As already mentioned many times, RRB Bhopal Technician Admit Card for CBT 2 is important for the candidates appearing in the examination. In the article, you can read in detail about how to download the RRB Bhopal ALP Admit Card 2019 and other important details. 04/02/2019 Latest Update: RRB ALP CBT 2 Rescheduled Exam Dates have been released. The exam will be conducted on 8th February 2019. Read the notice below. Visit the official website of RRB Bhopal to download Admit Card and intimation of Exam City. Only candidates whose exams were cancelled will be able to appear in this retest. 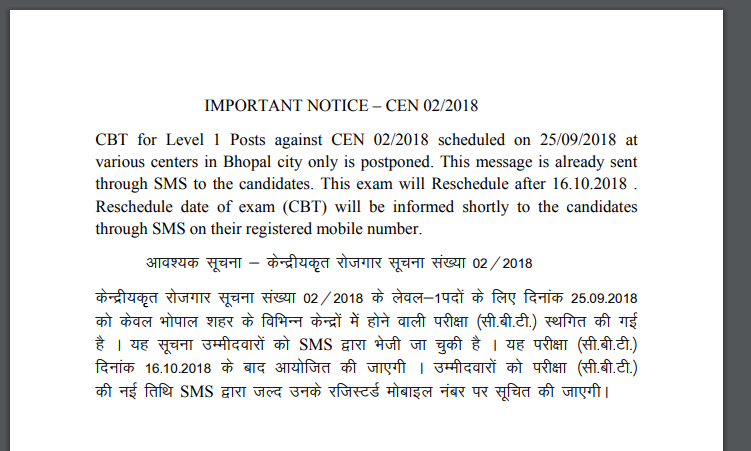 29/01/2019 Latest Update: RRB Bhopal ALP CBT 2 Exam for 22nd & 23rd January Re-Scheduled for various shift. 17/01/2019 Latest Update: RRB Bhopal ALP CBT 2 Admit card has been released on the official website. The candidates can follow the link given below and download their RRB Bhopal Technician CBT 2 Hall Ticket 2019 through Candidate’s Login. 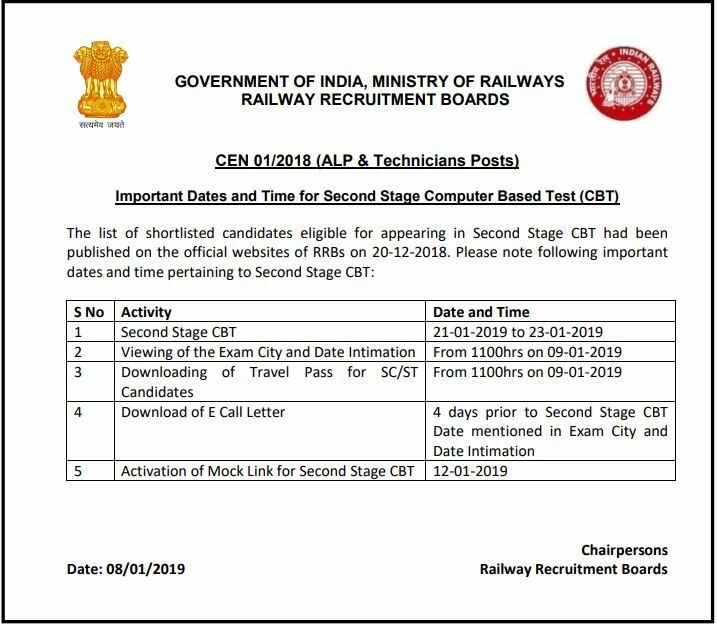 09/01/2019 Latest Update: RRB Bhopal ALP CBT 2 Exam Date and City has released on 09/01/2019 at 14:00 hours. RRB Bhopal ALP CBT 2 Admit Card 2018 -19 is expected to release from 17th January 2019. For the examinations to be conducted, RRB Bhopal ALP Admit Card 2018 -19 is the most important document to the candidates. The candidates will be appearing in batches for the examination. On 21st, 22nd, and 23rd January 2019, the examination will be conducted. Thus, it is expected that the RRB Bhopal ALP CBT 2 E – Call Letter will be available for download on the official website of RRB and the RRB Bhopal too. The candidates should remember in which regional RRB they have applied for the CBT 2 Examination as Admit Cards will be available on the respective Regional RRB website only. Along with Assistant Loco Pilot, Technician posts are also available for the recruitment process. The candidates are also appearing for the RRB Bhopal Technician CBT 2 Examination. Stage 2 Computer Based Test for the Technicians will also be organized on the same dates, from 21st January 2019 to 23rd January 2019. To appear successfully for the examination, it’s mandatory that applicants reach the exam hall on time along with the RRB Bhopal Technician CBT 2 Hall Ticket 2019. Though the procedure to download is the same, the candidates must remember the post and exam trade they have applied for. Following the basic procedure, we are providing you with the detailed process to download the RRB Bhopal ALP CBT 2 Hall Ticket. We will provide you with the link to download the RRB Bhopal Technician Admit Card 2018 -19. Still, if you are concerned you can always visit the official website and navigate your way to download the RRB Bhopal ALP CBT 2 Admit Card 2019. Follow the process below. Visit the official website of the RRB Bhopal. Check and Verify all the details mentioned on the RRB Bhopal ALP CBT 2 Admit Card 2019. Following details would be mentioned on RRB Bhopal ALP Technician Admit Card 2018 -19. Check all these details carefully. In case of a discrepancy please contact RRB Examination Authority and bring it to their notice that the Admit Card contains any kind of misinformation or incorrect details. Railway Recruitment Board will release the RRB Bhopal ALP CBT 2 Exam Dates and Exam City before they release the RRB Bhopal ALP CBT 2 Admit Card 2018 -19. The Candidates would be able to visit the official website and check the RRB Bhopal ALP CBT 2 Exam City and Dates. The candidates would receive the RRB Bhopal ALP CBT 2 Exam City in accordance with their region of RRB. The candidates would be able to be prepared with their traveling and other means before the admit card is released or the examination commences. Though RRB Bhopal ALP CBT 2 Exam Center will only be mentioned with the exact Address on the candidate’s RRB Bhopal ALP CBT 2 Admit Card 2018 -19. RRB Bhopal will issue RRB Bhopal Admit card 2018 to candidates whose application is accepted. RRB Bhopal Hall Ticket for Group D will be issued online 10 days before the online exam. To appear for an exam, one needs RRB Bhopal Admit card. You can download RRB Bhopal Group D Admit card /Call Letter by visiting rrbbpl.gov.in by submitting application registration details. A lot of candidates had applied for RRB Bhopal and they are eagerly waiting for RRB Bhopal Admit card 2018 for Group D.
Update (20.09.2018): CBT for Level 1 Posts against CEN 02/2018 scheduled on 25/09/2018 at various centers in Bhopal city only is postponed. This exam will Reschedule after 16.10.2018. The Link to Check the Exam City, Date, Time and SC/ST Travel Pass has been activated today (9.09.2018). The Link is available on all the Official Regional RRB Websites. The Link will stay activated from 14:00 Hours of 9th September 2018 for the candidates who have been scheduled for 17th September 2018 to 16th October 2018. For the remaining candidates, the link will be live from 30th September 2018. The RRB has announced RRB Group D Bhopal exam date. The RRB has scheduled the CBT Group D exam from 17th September 2018. The RRB Bhopal Group D Admit card will be available 10 days prior to the exam date. It is expected that board will release Railway Group D admit card for RRB Bhopal region between 5th to 7th September 2018. 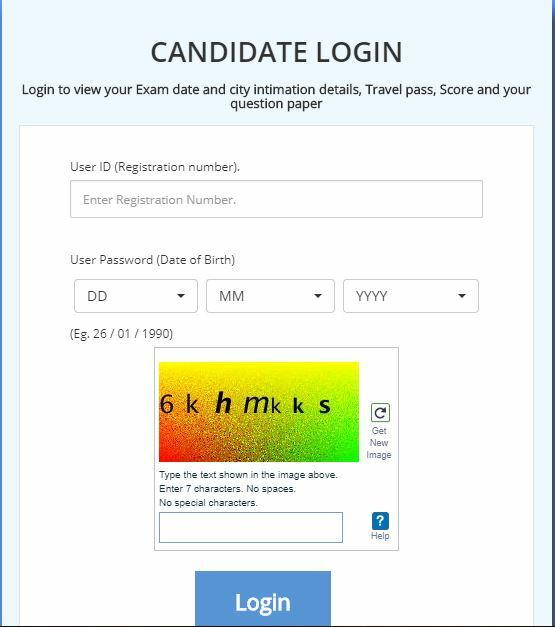 Candidates can easily download RRB Bhopal Admit card for Group D by logging in their registration number and password. Click on the link showing for RRB BhopalGroup D Admit card. RRB Bhopal Group D Admit card will be displayed on the screen. Download and save the RRB Group D Bhopal admit card 2018 for future use. Candidates those who have applied for RRB Group D Exam must be curious to know about the RRB Bhopal ALP Exam Date. Railway Recruitment Board Bhopal has finally released the First Stage CBT Exam date for RRB Bhopal 2018 for Group D. Check Exam Date for RRB Bhopal Group D Exam date & Also, Download RRB Bhopal Admit card 10 Days Before of Exam Date. RRB Bhopal has released the exam date for ALP (group-c) exam. RRB Bhopal Loco Pilot (ALP) exam will be held from 9th August to 31st August 2018. Candidates can download RRB Bhopal ALP Admit Card on 5th August 2018 (4 days prior to exam date). In order to download RRB Bhopal admit card, the candidates are required to submit the application along with application fee. 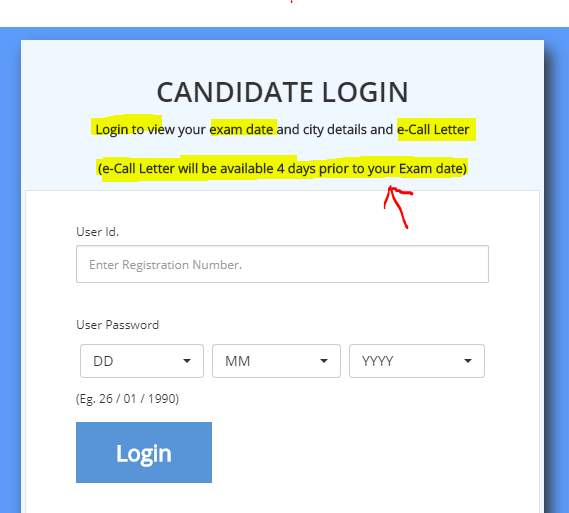 Also, you are required to first check the status of your application to check the eligibility in order to download the call letter of RRB Bhopal. In case your application gets accepted by the Railway Recruitment Board, then you can download your admit card from the given website. Also, note that RRB Bhopal does not send admit card via post or mail. Hence, if you are an eligible candidate you will have to download it online. Railway Recruitment Board, Bhopal is one of the regional recruitment boards of RRB. And the board conducts an online test to recruit Assistant Station Master, Assistant Loco Pilot, Goods Guards, Group-D, Traffic Assistant, Commercial Apprentice, Lineman, and other security staff. The board also release notifications in the employment news and invites online application for the same. And the eligible candidates will be provided with hall tickets to appear in the exam. At the time of admission, on the day of the examination, the candidate will have to show the admit card and the details will be matched with your identity card. And if the details match you will be able to enter otherwise, you will be stopped before the examination hall. Hence, it is important to verify the details on the admit card, once you have downloaded it. Also at times candidates are not able to download your Admit Card even if they have entered correct details, the hall tickets cannot be downloaded. In such case, the candidates should first check the status of their application. If the application has been approved by the Railway Recruitment Board BPL, then wait for 2 – 3 days and then try again. If the problem still persists while downloading the RRB Bhopal Hall ticket then you should contact the examination authority and tell them the whole story and provide proof of your application registration details.